Couple of months ago i got the idea of observing the sun using a solar filter. I ordered a cheap solar filter from Israel and placed it front of the telescope. Note that you have to adjust the filter in front of the the telescope not between the body and the eyepiece because high temperature can be developed inside the telescope's tube. Aligning the telescope to the sun using its shadow. Finally, we align as perfect we can the telescope. I aligned the telescope without the eyepiece because it was easiest to move it. The final result, note the sunspot on the right. Not perfect aligned and not the best quality, but for the 20$ price tag of the sun filter is a good opportunity to explore the sunspots. 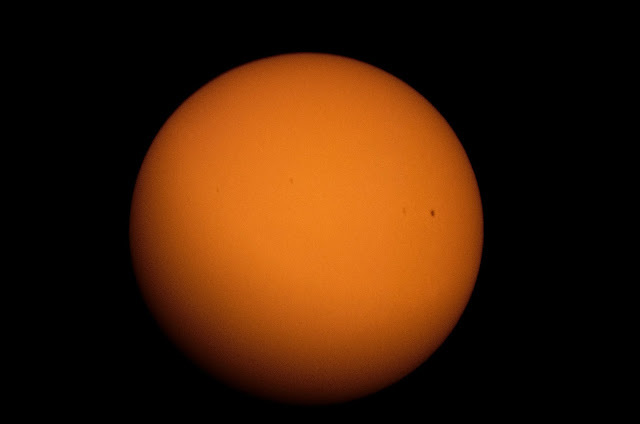 Photo of the Sun using the celestron travelscope and the sun filter.